"If I live everyday the same way I lived today, what kind of future would that create?" 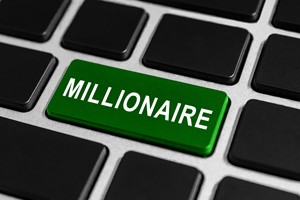 Most people dream of getting rich and becoming a millionaire. Though money doesn't buy happiness, it can buy a better, more fulfilling and stress-free life. Sadly, very few actually pursue their dreams and turn them into a reality. They become entangled in the everyday stresses of life and fail to employ the correct strategy for obtaining their desired success. Do you find yourself wondering why the amount of hours you've spent on the clock equals more than the number appearing in your savings account? Why exactly haven't you obtained your first million? Here are 10 more reasons why. Nowadays, it seems like everyone has an excuse for why they aren't where they want to be. Excuses may make you feel better about your current position, but they won't make you money. Take the bull by the horns and embrace the complex challenges associated with success. There is no sense in stressing over the inevitable. You will fail and you will make mistakes. However, you shouldn't view this as a bad thing. You've discovered a way your idea won't work. It's up to you to get creative and figure out a way that it WILL work. If you don't have a destination in mind and a clear plan in place to reach that destination, how do you expect to get there? Practice discipline and take the time to make a clear route to your success. Hanging around lazy, unmotivated people who fail to manage their money wisely won't feed your hunger for success. However, surrounding yourself with energetic and successful people will. Develop lasting relationships with likeminded individuals in your community. Look for those who can mentor and guide you on your quest for financial freedom. Invest wisely or perhaps build a business. Associating with others who share the same goals will help fuel your journey to successfully becoming a millionaire. You've heard it before. Attitude is everything. Pessimism is consistent with one thing only-failure. If you want to be successful, you must adopt a positive mental attitude. Steven Key, Co-Founder of InventRight, explains the Multiplying Effect in a 2014 article published by Entrepreneur. According to Key, one sure way to perpetually create wealth is to find a business opportunity that has a multiplying effect and that doesn't require your physical presence. Likening to the idea of collecting royalties, he suggests finding or developing something that can be used repeatedly-that people never stop needing. Most people save for a rainy day. Once that rainy day comes, they're forced to start over again. Instead of letting your money sit idly on the sidelines, treat your money as an employee-invest it, put it to work for you. Life can be hectic. Perhaps you work forty hours a week, have a family to take care of or all of the above. You have a great idea but when life gets in the way you justify building your empire tomorrow. To overcome this toxic way of thinking, view time as being finite/limited. It will motivate effectiveness and efficiency and allow you to better achieve your goals. Maybe you had a rough upbringing, or perhaps your life hasn't turned out the way you wanted it to. In order to get ahead and start making money, you must put an end to poverty thinking. There is an abundance of money, accessible to anyone who is willing to invest the time and hard work. According to a report provided by the North American Association of State and Provincial Lotteries, lottery ticket sales were just over seventy eight billion dollars in 2012. With an average ticket price of $2.00, that's a lot of people who are hoping to get rich quick. You probably would have had better odds and a greater return by conducting a bit of research and investing that $2.00 into Penny Stocks.